The Volkswagen Group is committed to sustainable, transparent and responsible corporate governance. The biggest challenge we face in implementing this at all levels and at every step in the value chain is the complexity of our Company, with its twelve brands, around 665 thousand employees and 123 production locations. In order to tackle this complexity in the best way possible, our focus is on coordinating our sustainability activities across the entire Group. We have a forward-looking system of risk management in place, a clear framework for dealing with future environmental issues, and attach great weight to social commitment and employee responsibility. Moreover, we are oriented towards the recommendations of the German Corporate Governance Code. For us, sustainability means simultaneously striving for economic, social and environmental goals in a way that gives them equal priority. The future program TOGETHER – Strategy 2025 places sustainable growth at the heart of our Group strategy: we want to be an excellent employer and a role model for the environment, safety and integrity, to excite customers and to ensure that we achieve competitive profitability at the same time. Our corporate citizenship activities also support us in this endeavor. We understand corporate citizenship as voluntary services that our company performs for society above and beyond our core business. These services address social challenges, but are also designed to promote business objectives such as improving our reputation, credibility and/or attractiveness as an employer. Specifically, they may take the form of financial donations or donations in kind, social sponsoring, operational projects founded on the Company’s initiative but also different forms of corporate volunteering. By 2025, we aim to make the Volkswagen Group the world’s number one in electric mobility. We have therefore set new priorities with Roadmap E. We also need to ensure that we detect risks and opportunities in the areas of environment, society and governance at an early stage at every step along the value chain. 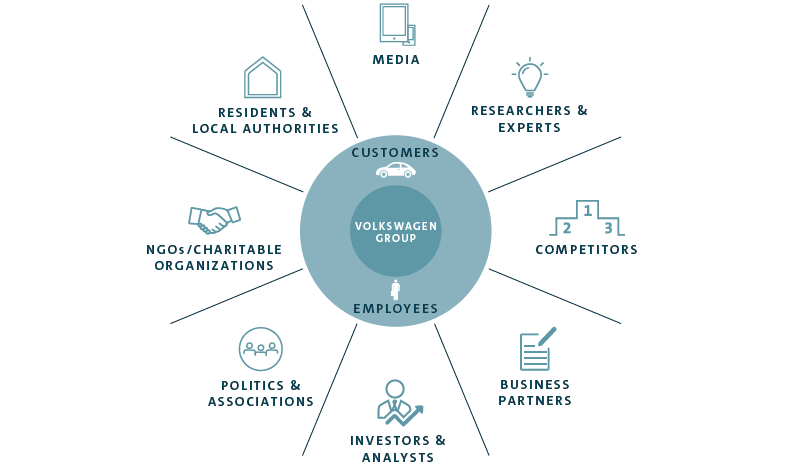 The Volkswagen Group has created a clear management structure to coordinate the Group’s activities as regards sustainability – including corporate citizenship. Its highest committee is the Group Board of Management. It is regularly briefed by the Group Sustainability steering group on all issues related to the topics of sustainability and corporate responsibility. The members of the Group Sustainability steering group include executives from central Board of Management business areas and representatives of the Group Works Council and the brands. The steering group’s tasks include identifying the key action areas, making decisions on the strategic sustainability goals and programs, using indicators to monitor the extent to which these goals are being met and approving the sustainability report. Sustainability activities are planned and managed by the functional area Group Sustainability. Its duties include coordinating all sustainability activities within the Group, the brands and the regions. These also include stakeholder management at Group level, for example contact with sustainability-driven analysts and investors. In addition, project teams work across business areas on topics such as decarbonization, human rights and sustainability in supplier relationships. This coordination and working structure is also largely established across the brands and is constantly expanding. Activities in fiscal year 2018 focused on strategically realigning the functional area Group Sustainability and anchoring sustainability in our core business, as well as on developing a sustainability program that places emphasis on climate protection and sustainable supply chains, among other things. To support its strategic sustainability goal, the Volkswagen Group appointed a Sustainability Council in September 2016. This is made up of internationally renowned experts from the academic world, politics and society. The Council establishes its own working methods and areas of focus independently, has extensive rights for the purposes of exchanging information, consultation and initiating action, and consults regularly with the Board of Management, top management and the employee representatives. In 2018, the projects initiated by the Council the year before were commenced: a dialog platform for innovations and cultural change in the area of sustainable mobility, an international program for mitigating the effects of climate change through forecast-based civil protection financing and a scientific study for designing future traffic policy in line with international climate targets. In addition, the Council decided on a further project for the strategic focus of sustainability at Volkswagen and the establishment of a visiting professorship for open labs and cultural change at the Einstein Center Digital Future in Berlin. Furthermore, the Sustainability Council formulated recommendations for how technological, political and cultural change should be organized to win back trust and lay the foundations for future success. Two developments in 2018 continued to influence the detailed analysis as to which issues are material to the Volkswagen Group: the alingment of the Group as part of the future program TOGETHER – Strategy 2025 and dealing with the consequences of the diesel issue. As the starting point for our analysis, we are oriented towards the Sustainable Development Goals (SDGs) formulated by the United Nations, which describe the social challenges facing companies. Based on the results, we defined 18 key action areas for achieving our goal of becoming one of the world’s leading providers of sustainable mobility. In order to identify key topics, we took into account external studies, sector and media analyses, ratings, stakeholder surveys, internal and external guidelines and codes, the Group-wide future program TOGETHER – Strategy 2025 and the individual departmental strategies. As the details of the Group strategy have not yet been finalized, we are still in the process of specifying the content of the key action areas and defining corresponding values, targets and indicators. Voluntary commitments and principles that apply throughout the Group form the basis of our sustainable focus. In addition, our sustainability model provides the framework for sustainable and responsible action. The Volkswagen Group’s Code of Conduct applies to the entire Group and helps managers and employees alike to deal with legal and ethical challenges in their day-to-day work. We expressly support the United Nations Global Compact, an agreement between the UN and the business world aimed at enhancing the social and ecological aspects of globalization. As long ago as 2002, the Volkswagen Group made a commitment to promoting human rights, labor standards, environmental protection and combating corruption. We are seeking reincorporation of our membership in the United Nations Global Compact, which had been suspended following the diesel issue; talks on this were resumed in 2018. In addition, our objective is to ensure that our actions are in line with the declarations of the International Labor Organization (ILO), the principles and conventions of the Organisation for Economic Co-operation and Development (OECD) and the international covenants of the United Nations on basic rights and freedom. We have established our own internal guidelines in the form of the Volkswagen Social Charter, the Charter on Labor Relations, the Charter on Vocational Education and Training, and the Charter on Temporary Work. The environmental policy and the environmental principles for products and production, which apply throughout the Group, are mandatory for environmental protection. Our stakeholders are individuals, groups, or organizations who have a material influence on or are materially influenced by the way in which the Group reaches its corporate decisions and the implications of those decisions. Our customers and our employees are our key stakeholders. Around this core, we have defined eight types of stakeholders. This classification is the product of a stakeholder analysis in which we regularly identify the Group’s key stakeholder groups. The role of stakeholder management is to enter into dialog with stakeholder groups in order to manage the many demands placed on us and integrate them into decision-making processes. To be able to systematically incorporate our stakeholders’ suggestions and recommendations, we have set up councils such as the Sustainability Council and the Stakeholder Panel. The Panel is comprised of 300 national and international opinion leaders. In addition, we offer our stakeholders a broad range of opportunities for interaction and feedback channels including regular stakeholder discussion events, stakeholder surveys and international partnerships.